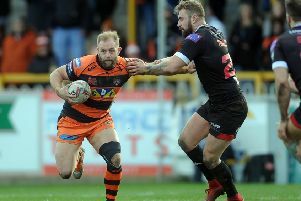 Castleford Tigers skipper Michael Shenton has backed Rangi Chase to step in this week with the side missing playmaker Luke Gale, who is on England duty. The Tigers will also be without full-back Zak Hardaker and back rower Mike McMeeken for their game away to Huddersfield Giants on Thursday, but Gale will be a big loss based on how much he was missed when he went off injured against Hull recently. However, Cas did not have Chase that day and he is fit again after a wrist injury and ready to step in. Shenton is confident that Chase will fill Gale’s boots well. He said: “He has got himself back on track. The last few weeks he has been good at training. “It’s important because with Luke Gale going he’ll have to play for us at some point. “Over the Easter period we missed Rangi and his involvements and it was pleasing to get him out there.